At 424 meters, Pic Paradis is not only the highest point in Saint Martin, but also the only hill that has been made accessible, even for cars. However, this does not mean that this is necessarily taken advantage of. The narrow and steep road does not really allow for extensive use anyway. Despite the incomparable view over the whole island that Pic Paradis offers, it is not a popular destination for tourists. The roads have mainly been built for access to the telecommunication towers at the top, and for the people who live here - those who prefer to live a life as quiet and isolated as it can get in Saint Martin. 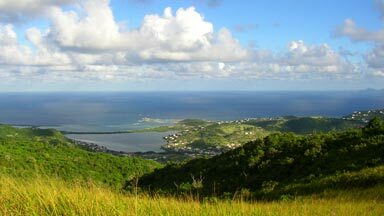 The plateau overlooks Orient Beach, French Quarter, Dutch Quarter, Oyster Pond and Philipsburg as well as the neighbouring island of Saint Barths. On the opposite side one can look upon Marigot Bay in front of Simpson Bay and Terres Basses, with the flat British island of Anguilla in the background. 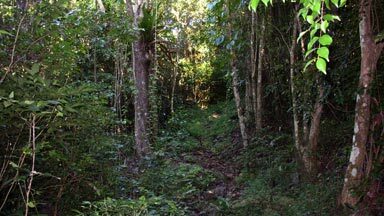 On this hill with its cooler temperatures there is also Saint Martin's only piece of rain forest. Numerous hiking trails have their starting point here. 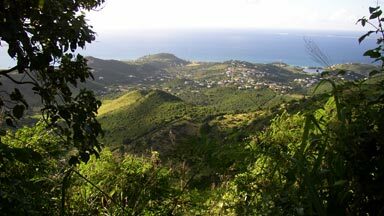 Guided tours through the island's hills are offered. But one cannot really speak of a tourist interest in the island's unspoilt nature. After some problems in the past concerning the maintenance of the trails, particularly on the French side, efforts are now being made in cooperation with the Dutch side to get the ecotourism going. David is a real nature guy and leads groups through the unspoilt hills of the island's interior, such as Pic Paradis. Since David needed a life in nature, he moved from France to Saint Martin - but also in the knowledge that he does not have to do without anything on this so developed island.